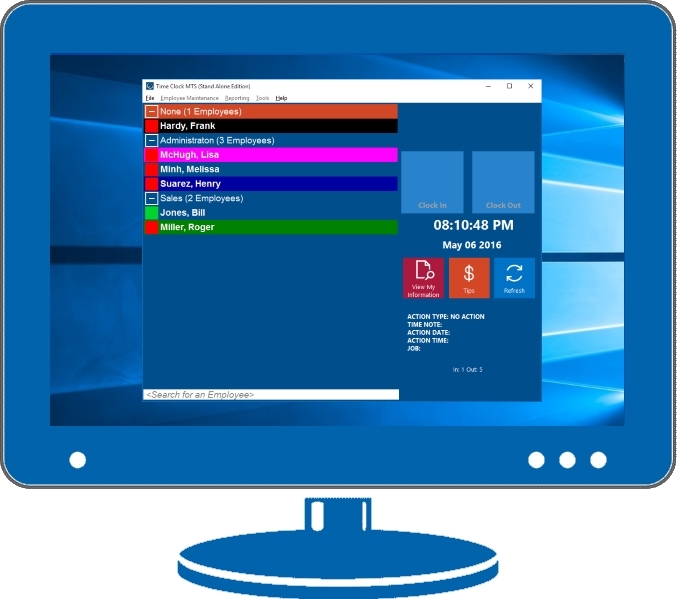 A full featured employee time clock program for a single computer in your office. Affordable and easy to use, Time Clock MTS is great for small offices. It can be installed and configured in just a minute or two and runs on almost any Windows computer, including those still running Windows XP. Able to track and report on the time clock information for up to 500 employees the Time Clock MTS Stand Alone Edition will grow as your business grows and allow you to track more than just time. It can be as simple, or as complex, as you need. 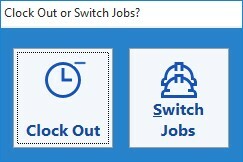 This screen is used by employees to switch jobs during the work day. About 3 years ago we’ve used manual print time recording machines that used up ink and paper time cards. Since switching to your system, we’ve cut down costs of ink and paper down by around $750+ a year. Your employees will immediately save time because they can punch in and out from one computer. No more writing in time books or filling out scrappy timesheets and handing them into the pay office. And of course, you’ll save time processing payroll because you won’t be chasing those employees any more, and you won’t be double entering time information into spreadsheets or into your payroll system. The Time Clock MTS Stand Alone Edition includes dozens of reports which can be printed to PDF, or exported to other programs. 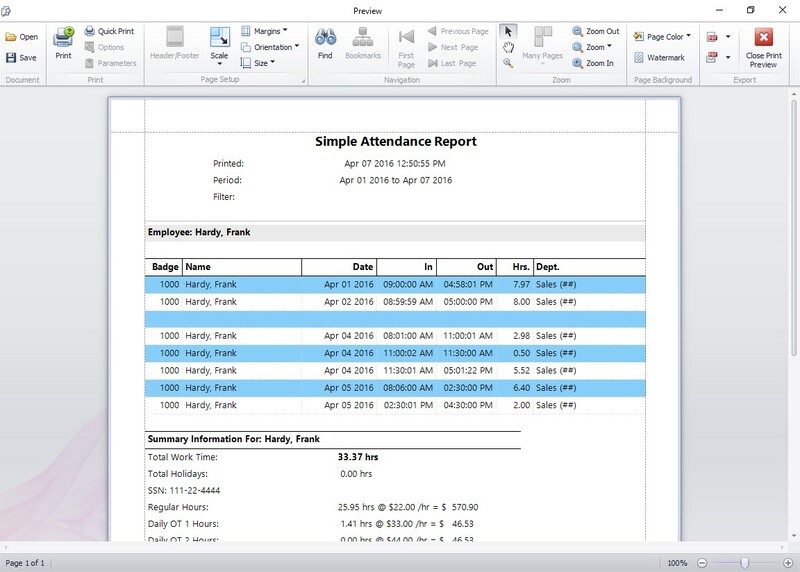 They show you the real time attendance information about your employees and are generated in seconds. And we will take care of all the hard stuff for you, including overtime calculations and tracking of sick time and vacation time. All in one system with no extra effort required on your part. It doesn’t get much easier than that! Try it for 30 days without restriction. Your employees can punch in and out as many times as you like.